Active Gas Services specialises in gas fitting, installation and repair for small businesses, shops and restaurants across Brisbane, Redlands, Logan City, Bayside and Suburbs. Safe installation, replacement, service & repair of professional gas hot water systems, including the latest from Aquamax, Rinnai and Bosch. We specialise in a wide variety of different gas appliances, including bulk hot water systems; continuous and large scale applications, for example apartment buildings and commercial/industrial facilities. Stoves, deep fryers, ovens, griddles, flame grills, cooktops, wok tables, gas pasta cookers, salamanders and other commercial gas appliances for restaurants and cafes, commercial kitchens, and the hospitality industry. 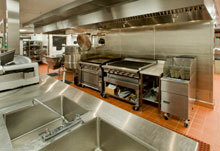 We also offer specialist oven repair and stovetop repairs for all gas cooking appliances. Commercial boilers, gas fireplaces and other business heating solutions. We specialises in a wide variety of different solutions depending on your needs and requirements. From large scale ducted and flued systems for multi-stories complexes and industrial locations, down to smaller freestanding and integrated solutions, we have the application that meets your needs. Gas safety checks, maintenance and servicing - keep your workplace safe from gas leaks or other preventable hazards. We perform certification and compliance checks on a wide variety of gas applicances and systems. As a licensed gas fitter, we can ensure that the continued operation of your system or appliance is safe, and meets all applicable health and safety regulations. No matter what size or scale your commercial or industrial gas fitting, installation or servicing is, we have the expertise, experience and ability to ensure that your requirements are fully realised.